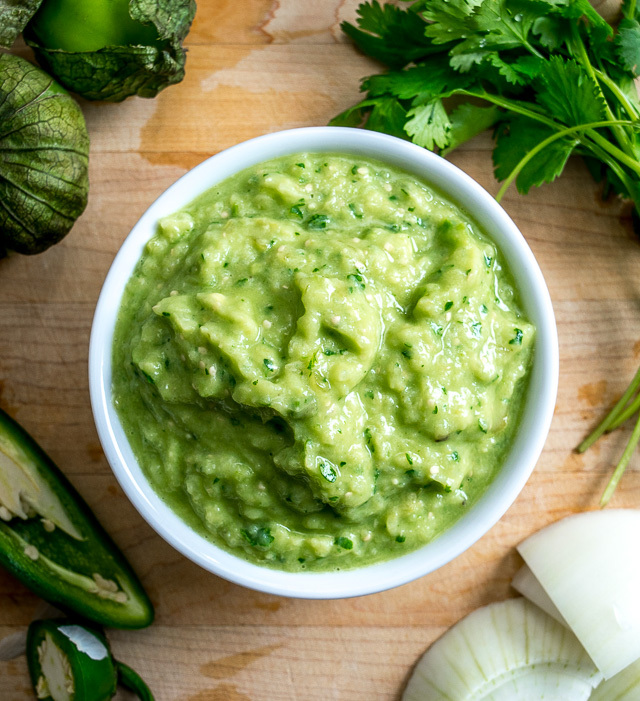 Avocado Salsa Verde usually inspires a gushing “What is this?” from those who’ve never made it at home before. It has such a vibrant, distinct flavor that people assume there are some big-time chef skills involved in producing this masterpiece. But there’s not. 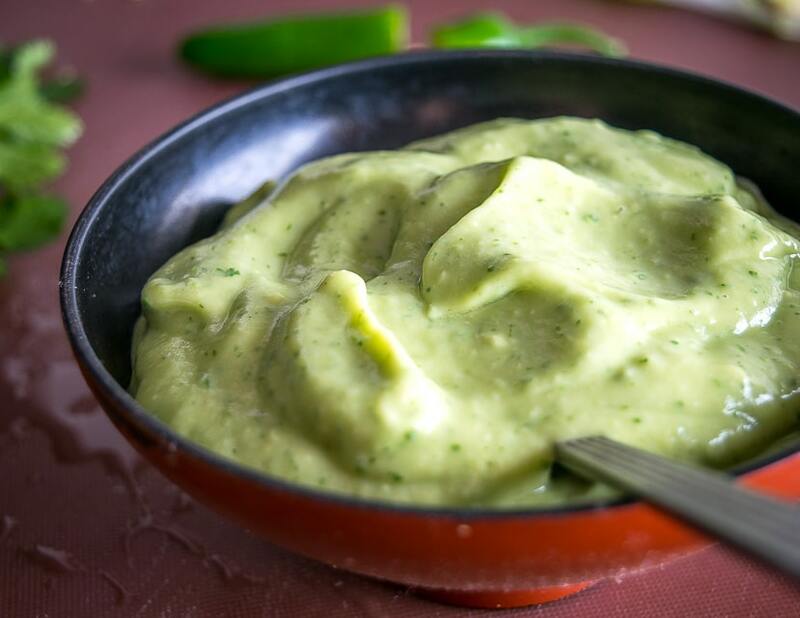 It happens to be one of the easiest of Mexican sauces to make, and once it’s part of your repertoire you’ll come back to it time and time again. In addition to being the ultimate you complete me partner for dishes like Spicy Black Bean Nachos, this Avocado Salsa Verde will instantly improve just about anything you pair it with. This is Recipe #13 of our free Mexican Cooking Survival Guide that details 27 droolworthy Mexican recipes you can make from a simple, inexpensive pantry list. After serving this to your loved ones and accepting all forms of compliments, you might feel a pang of guilt for not giving credit to Mother Nature for the two gems that make this magic happen. 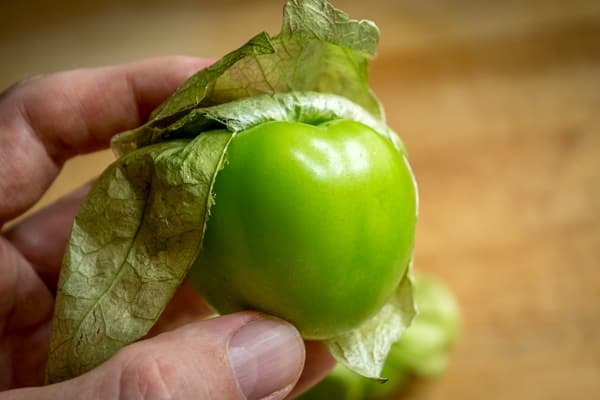 If you’ve never bought tomatillos before, you can usually find them near the jalapenos in the produce section. Take a peek under the husk and buy the ones that are taut and green on the inside. Of course, some markets don’t carry them at all as the dreaded salsa aisle is constantly reducing demand for the real deal. If you can’t find them at your go-to grocer, it’s worth trying a gourmet store or a Latin market. And don’t forget that you can always default to using canned tomatillos. You’ll still end up with a sauce that’s far superior to anything you can buy pre-made. You’ll find canned tomatillos in any market that has a Latin goods section. Okay, assuming you’ve got 4-5 fresh tomatillos on hand, first pull off the husks. They’ll be sticky on the inside so give them a good rinse. 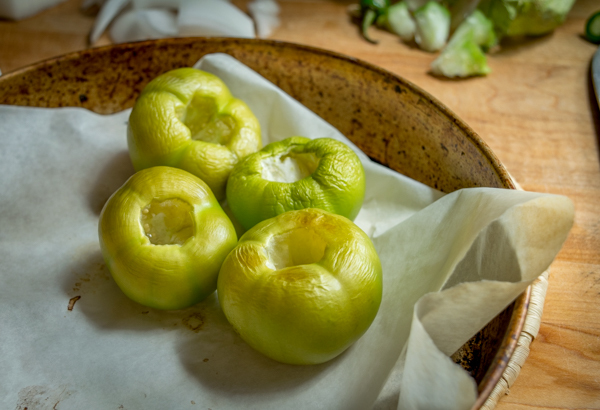 Uncooked tomatillos are tart and acidic, so we’ll roast them to sweeten them up and lower their acidity. My default method is to put them in the oven at 400F. I typically cut out the stem portion but you can consider this optional. 10-15 minutes later they’ll start to shrivel and turn army green. Done! If you’re using canned tomatillos, you don’t have to roast them as it won’t have the same effect on them. Add the tomatillos to a blender or food processor along with 1/2 onion, 1 garlic clove, 1/2 jalapeno pepper (or serrano), and 10-12 sprigs of cilantro. Pulse blend the ingredients and give a taste for heat level. If it’s not spicy enough for you add the other half of the jalapeno (or serrano). Note that Salsa Verde is typically made with serrano peppers but we are using jalapenos here. Serranos are sharper and have a slightly different flavor than jalapenos. But they are so closely related that 75 percent of the time I make Salsa Verde I am using jalapenos. So don’t sweat it if it’s hard to find serranos in your neighborhood as jalapenos will give you an equally good result. 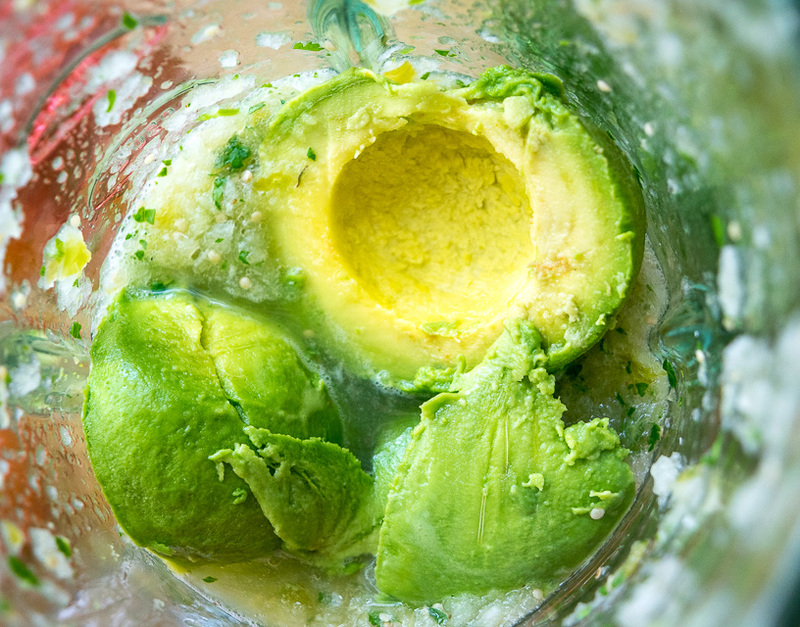 Once you’re happy with the heat level add the avocado and blend together. Take a taste and thank the heavens for this delightful combo. If you found the heat level got diminished a bit by adding the avocado, feel free to add more jalapeno. And you can salt to taste here too, sometimes a pinch gives it a boost. While adding this beauty to a serving bowl it’s best to start coming up with a potential answer for the big question that is already on its way…. 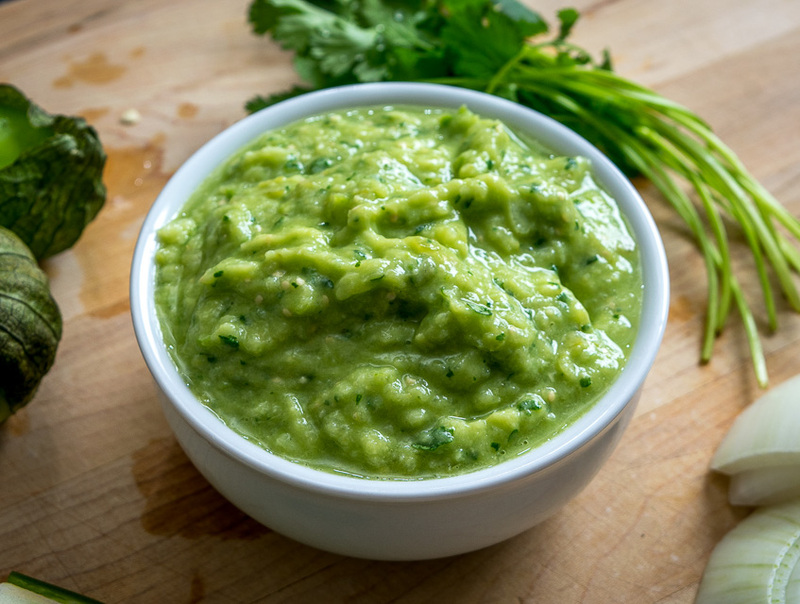 Avocado Salsa Verde has one of the best flavor-to-effort ratios in all of Mexican cuisine. You'll get incredible flavor from very little effort by using just a few key ingredients. Pull the husks off the tomatillos and give them a good rinse. Cut the stems out of the tomatillos if you want. As described in the instructions, I always recommend adding the jalapeno pepper incrementally the first few times you make this sauce. This gives you a good idea of your preferred heat level. If you are sensitive to spicy foods you can start by adding ¼ of the jalapeno at first and tasting for heat level. If you are using canned tomatillos, don't bother roasting them. It doesn't have the same effect on tomatillos that have been resting in liquid. Using the cilantro stems is common in Mexico. I typically twist off the thicker, bottom portion of the stems but keep the upper portion of the stem that connects the leaves. We also like to serve this Avocado Salsa Verde with our Roasted Poblano Quesadilla, our Chicken Tingadillas, and most recently these Spicy Beef and Cheese Empanadas. 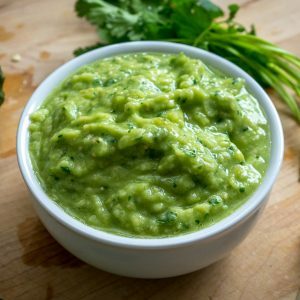 For an even lighter consistency, try making Salsa de Aguacate. This Looks SO DELICIOUS. Just the right thing to eat on a grey november day. This salsa is like the one wwe we loved at Ninfa’s Mexican restaurant in when we lived in Houston, Tx. over twenty yrs. ago!! Loved if. Thanks for the recipe. Is this recipe ok to store? Unfortunately with the avocado it is not going to keep for very long. Sometimes I’ll put it in the fridge in a small tupperware container and use it the next day, but it will be slightly discolored and not have the same zip. I rarely keep it around for much longer than that. I made some over a week ago and I added extra lime and it still has kept it’s green. I came here searching for shelf life though. It’s been in a mason jar. Wow that’s good to know, thanks for your note Amber. I might have to try this as mine never lasts that long. Cheers. The secret is to keep the Avocado seed in the sauce . I’m Mexican and my whole family’s done this .. you’ll be surprised . I made this last night. I love it so much I could drink it! 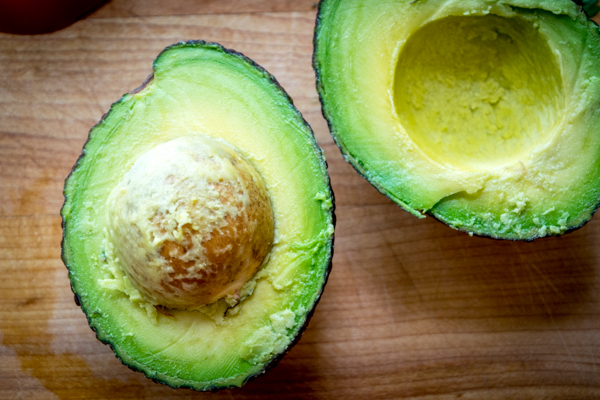 Or keep some avocados in chunks. I love this recipe, but I want to make a large quantity. Can this be canned and preserved? Thanks Sheila! Hmmmm although I’ve never tried it I don’t think this would preserve well with the avocado in it. An alternative could be to preserve the remaining ingredients (the salsa verde) but to be honest I usually just make a fresh batch as that always seems to taste best. Thanks Sophia! So glad you found a keeper recipe on the site. Hope you have a good holiday season. I have to say I just found your Blog & am loving SO many of your recipes! Thank you so much..will sign up for your e-mails! Thanks Penelope, glad you are finding some keeper recipes! I make this, but in order to preserve it I keep the avocado separate from the tomatillos and just mix in a freshly sliced avocado as I use it. Hey thanks for mentioning this Brandy — I do the same thing with leftover Salsa Verde and it works like a charm! What exactly differentiates this from guacamole? The tomatillos? And BTW, I love raw tomatillos! Hey Alice! Yeah it’s like the child of Salsa and Guac parents and will taste different than Guac because of the tomatillos — typically you won’t get that flavor in Guac. 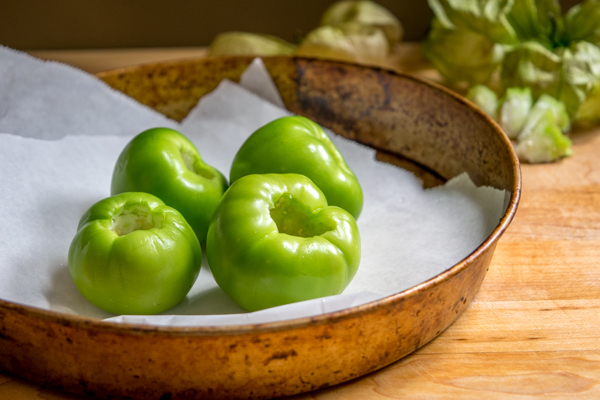 If you’re a fan of tomatillos then you should try it, most likely it will be a keeper for you. Cheers.